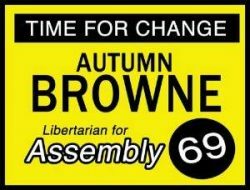 The Libertarian Party has been forced to fight for fairer ballot access laws for more than four decades, and has successfully done so in many states, playing a key role in improving their ballot access laws. Many detrimental laws still exist, though, and some states have made these laws considerably worse during the last few years. State laws, rather than federal laws, have complete control over ballot access laws, so their fairness varies widely throughout the United States. This diversity between states can make it easier to affect any particular law, but it also means that the United States, almost uniquely among countries that have the reputation of holding free elections, has many laws that make it difficult for any party other than the those of the Democrats and Republicans to place its nominees on the ballot.